For two twin girls due to make their appearance in just a few days! 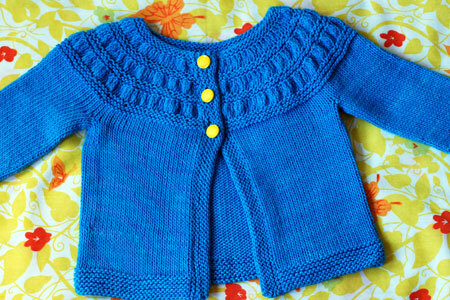 Pattern: Tiny Tea Leaves Cardi by Melissa LaBarre for Madelinetosh. 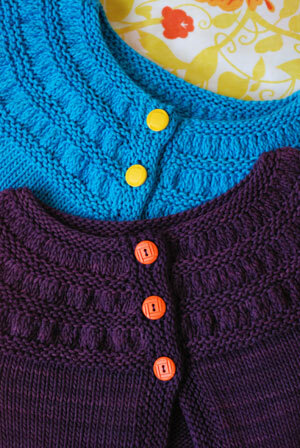 Yarn: Araucania Ulmo 100% cotton in Bright Turquoise (767) and Medium Purple (759), 2 skeins for each sweater. Read my quick summary here before hitting WEBS, where it’s still on a great sale! I got really lucky with the Bright Turquoise: the two skeins were indistinguishable in color, and I didn’t have to alternate balls every two rows. Medium Purple didn’t have such luck, and you could clearly see the color difference between the two skeins. I alternated the balls every two rows, except for the yoke and garter stitch sections, where I used one skein or the other. I think you can see the subtle stripes in the photo below. Needles: While the yarn label recommends US 5 needles for Ulmo, I found my stockinette to be a little too dense if I used them. So I went up a size to US 6 for the main part of the sweater (the stockinette). My gauge was 5.5 spi and 8 rpi. The garter stitch sections were knit using US 5 needles for a little extra oomph in the ruching. Gauge and size: The smallest size in the pattern is to fit a 2-year-old, but I was aiming for something in the 6-months range. So I used a thinner yarn than recommended, followed the directions for the smallest size when it came to stitch counts, and Budgie numbers for the inch dimensions. I ended up with a sweater that’s approximately 21″ across the chest, 10.75″ from hem to shoulder, and 7.5″ from sleeve cuff to armpit. The buttons are my favorite detail! As I mentioned, I chose somewhat nontraditional “baby girl” colors, and wanted to make sure the buttons were bright and cheerful! As always, Windsor Button to the rescue! I personally love both choices, and I hope the baby girls love them, too ;). Both sweaters are adorable. The button choices are perfect. Great contrast & lots of fun! They’re so cute. The sweaters are beautiful, and I love your button choices, too. Those sweaters are sooo cute! These are unbelievably adorable! I’ve just added the pattern to my queue. So cute. The colors are great for babies too. Those twins are going to be fashionistas. The tiny tea leaves are much more attractive than the grown up edition. They are great. Thanks so much for posting about these. I have a tiny grand-niece who will be getting one come fall. I can’t really handle this post right now, but the sweaters are beautiful. They are gorgeous!! Those colors will look great on the babies. Those sweaters are adorable! The subtle striping on the purple one is actually pretty cute. So sweet! I’m so glad we don’t just have to knit in pink or yellow or soft green anymore! Those are just too cute. I actually quite like the striping in the purple one. Beautiful! 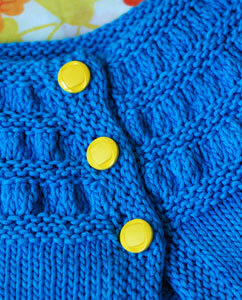 I love non-traditional colours for baby knits. Babies don’t have to exclusively wear pastels! Many thanks again, Kathy! They are just perfect. I totally ripped off your Tiny Tea Leaves idea and immediately cast on for one for my daughter. Just finished it today. LOVE IT! Thank you for the heads up on it. I hope the mom will let you post pics of the twins wearing them — you did a really lovely job! Love them so much!!! 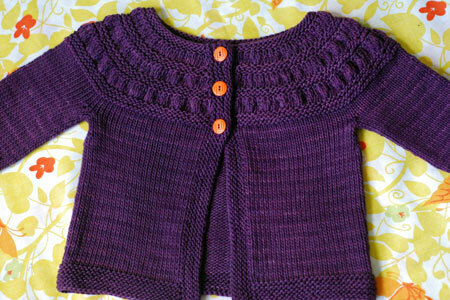 I didn’t even know that there was a tiny lea leaves cardigan pattern. i’m casting on today!! thank you for the inspiration. Love the sweaters! When I saw this pattern for big girls I didn’t even think of translating it for little girls but it’s a great little girl sweater! 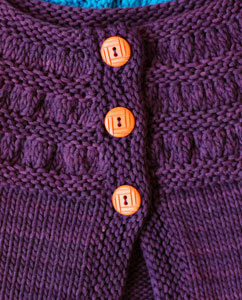 Those buttons are such a great detail. Those are both gorgeous little sweaters, and I love the idea of a cotton yarn for the summer (though I’ll admit that I find knitting with some cottons pretty hard on the hands). Beautiful! What a nice job! what a wonderful gift! they are lovely. Oh,these are lovely! I’m especially fond of the subtle purple stripes. Absolutely gorgeous. Those colors are wonderful! I have to put this in my “to knit” list! I adore these cardigans. The colors are so fun for babies! They are both adorable! Your knitting is absolutely beautiful! I LOVE the subtle purple striping!!! I might have to do that on purpose sometime! June is a lucky lady to have these beautiful sweaters for her girls. these are so so so unbelievably adorable! Lovely sweaters! The sizing is perfect and they will be able to wear them for a long time. My twin granddaughters (2yo) can still wear the sweaters I knit in a 12 month size and they are not small girls. Just perfect! Great colors and fabulous button choice! They will be the cutest babies on the block! I love the colors you chose, so perfectly unexpected. and I have to try this Ulmo yarn once my arm gets better! Awww. I especially love that you didn’t pick pastels. I love seeing babies is bright bold colors. Of course, the pattern and knitting are simply perfect. What lucky little girls. I love the colors you chose! So beautiful. The girls will look darling in your sweaters. They’re lovely! aww, they came out great! you are such a generous knitter. They are so sweet! I just love your button selections! They turned out so cute! I especially love the purple. My favorite color! I always forget that I could stripe two different dye lots. And thanks for the button tip. I’m always looking for better buttons than what’s available at the local JoAnne’s.